Mohamed Nasheed, the president of Maldives, stepped down on February 7. Mohammed Waheed Hassan, the vice president of the country, has taken over as the president until elections are held to choose the next leader. About a month ago, Nasheed ordered the arrest of a court judge because Nasheed believed the judge was not fair. People felt it was wrong of Nasheed to forcefully arrest a judge. Some Maldivians started protesting. Recently, a group of police officers decided to join the protesters. Their demand was for Nasheed to step down, and he did. According to Nasheed, he was forced to resign by the army and the police. Now Nasheed’s supporters are protesting, and there is rioting in the country. Maldives is a very interesting country. It is made up of thousands of beautiful islands, but it might soon be gone! The country is known for its white sandy beaches, blue water, coral reefs, and palm trees. However, most of the islands are less than 1 meter (3 feet) above sea level. One of the country’s big concerns is the rising sea levels caused by global warming. Some scientists have estimated that the temperature increase on Earth will cause the sea levels to rise by around 2 feet (60 cm) within a hundred years. This would put most of Maldives under water! 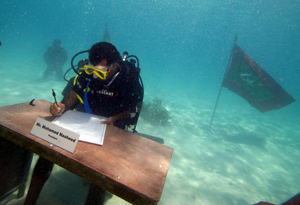 Two years ago, Nasheed tried to bring the world’s attention to this problem by holding a meeting underwater where all the participants wore diving suits and had oxygen tanks. Nasheed also declared that the country was putting some money aside in case it has to buy land in some other country to relocate its citizens. 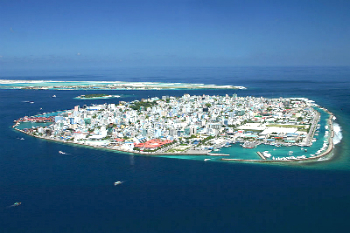 The capital of Maldives is the busy, bustling city of Male. Almost a third of Maldivians live in Male. The official language is Dhivehi. Maldives was under the control of the British for almost 80 years, and got its independence in 1965. Nasheed became the president of the country in 2008 after winning the country’s first democratic elections. The former president had ruled for 30 years.